Things are changing in Cuba. Seemingly, they are moving at a pace the rest of the world is enjoying but anxiously waiting to speed up for its great benefit. However, word on the street, especially in Havana, is that the mediocrity (and that may be a bit of fluff) is still felt. Food is still rationed, lines are still long, people are still hustling. People still can’t leave. Long before the idea of “opening” up Cuba, giving her access to the US, people on the outside were curious about this mystical place with a beautiful malecon. What makes Cubans so special? So happy? So enigmatic? WHO are its people? It’s a question many ask but few explore beyond the news conferences, popular Cuban-American politicians in Miami and even Pitbull — a highly glorified Cuban rep. But even Pitbull’s claim to fame — though he was born and raised in Miami — has a root. His love for hip hop, the culture, the message, and his distinctive beat, comes from an underground culture in Cuba. There exists an unglorified and barely-seen rap culture that many Cubans live in but few, if any outside the island, know about. 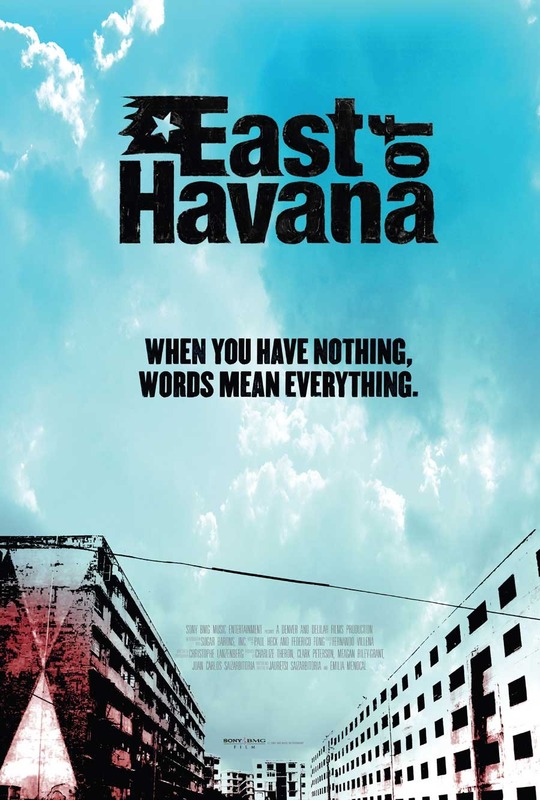 I first saw ‘East of Havana‘ by sheer accident in 2008. I was living in Atlanta at the time and flipping channels one night when I saw a tittle that caught my attention. My family lives in east Havana. But in the few times I’ve visited, I’ve not seen any of what this documentary illustrates. I was shocked and excited. Confused and enamored. Beyond the artistic talent Cuban youth and young adults share with the rest of the world in so many realms (baseball, dance -specifically ballet – jazz, and boxing), there’s the message their medium holds. In the case of rappers and hip hop culturists, which is the scene this Charlize Theron film explores, it’s about freedom. Not just figuratively, but also literally. The message is of anger, resentment, truth, and hope. This documentary was released a little over 10 years ago. You and I can sing a very different song if it were based on our individual changes in a decade. For them however, their songs still carry the same beat, have the same message, perhaps, only the rhythm is a bit faster. As things continue to change and evolve on the island I was born on, so intimately love and have so much to still get to know, we’ll see an influx of ideas, stories told and surfacing anecdotes of a time when Cuba was the Caribbean Island’s paradise. A time when music was a love story and not a plea. This is the documentary in its entirely. Watch and enjoy. It’s worth the knowledge.